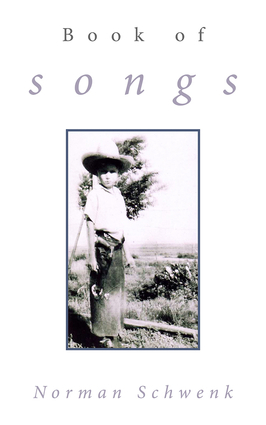 Norman Schwenk's new collection, Book of Songs, brings together poems and song lyrics of many varieties: love songs and ballads, dance and battle songs, satires and laments; there is a march, a lullaby, a hymn, a rock-and-roll song, a Christmas carol, a birthday song, a cowboy song, and even a song for a klezmer band. His models are the Scots bard Robbie Burns and the Essex singer-songwriter Adrian May, whom he calls his "song-writing mentor". He also pays homage to his American contemporary, Tom Waits, the Elizabethan song-writer, Thomas Campion, and the Victorian lyricist, W.S. Gilbert, whom he describes as "an honorary Schwenk". Norman Schwenk was born and grew up in Nebraska and was educated in the USA. He taught literature and writing at the University of Pennsylvania, Uppsala University in Sweden and Cardiff University in Wales. Norman has been writing and publishing verse in the US and the UK for more than 60 years. His most recent collections are The More Deceived: poems about love and lovers and Cadillac Temple: haiku sequences. Married to the Welsh writer Deborah Kay Davies, he lives in Cardiff.